We went to Rimini in April, which is a great time to visit. The hotels were plentiful and cheap, and the beaches were definitely not crowded. I can imagine that it is pretty crazy in the summer! There are lots of things to see though other than the beach, so definitely worth a visit. I'd heard a lot about Rimini before going there, but noone ever told me how cute the historical centre is! Plenty of bars and coffee shops, people going for evening walks eating gelato. Nice break after the crazy strip along the seaside! Rimini has a great strip along the beachfront for entertainment and great Italian food. The beaches are clean and have lots of activities such as volleyball if you don't just want to sunbathe. Dependant on your hotel is where you go on the beach to rent sunbeds and parasols. The nightlife is good for young people with beach parties and such but still pleasant for families with beach side markets by the marina. The old town a short bus ride away is good for history and tickets for the buses can be bought at local newsagents. However be aware of pickpockets as we were once a victim of this on a bus where a few gathered around and managed to take a few hundred euros from our pocket when the bus suddenly jerked forward. The police in Rimini are however very helpful in these kinds of situations and hotel staff were more than happy to translate anything we needed. Rimini is a sea-side resort city of about 150,000 people, most famous for it's 15 km-long stretch of sandy beach. 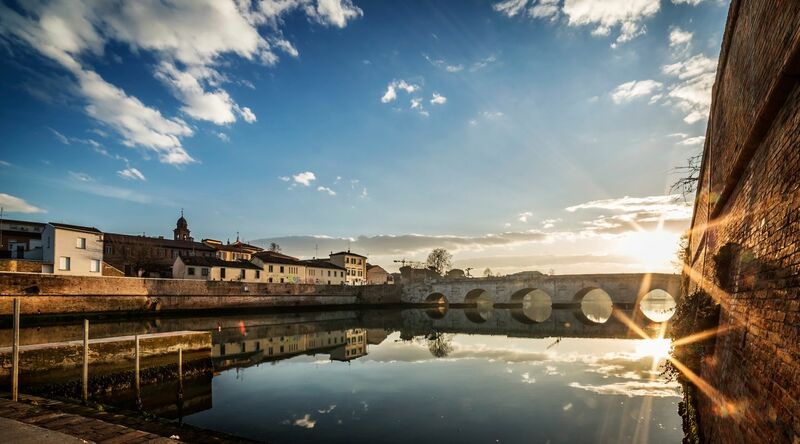 Rimini's history reaches back to Roman town's and there are historic buildings and remnants around town. Rimini is a great base to visit San Marino. Rimini has a special place for me.It was my first experience with solo travel abroad.When I arrived there I understood that I made the right decision.It has 15km of sandy beach on the Adriatic Sea.It is most popular place in Italy and very nice area for summer holiday. Rimini is a fun beach-side resort town that has two faces: the neon lights of the coast, shining amongst the oontz-oontz-oontz of the clubs, and the classiness of the historical district, offering shopping from Emporio Armani to piazze with statues of both Caesar and a seated Pope. While the city itself isn't that big, it's a great place to catch some sun. More notably, Rimini's station is perfectly stationed for trips to nearby towns in Romagna, most notably Santarcangelo, Ravenna, Cesenatico and Bologna. Florence and San Marino are also easily reachable.